SUE Solutions contracted with UDOT Region Three on this project through the On-Call Contract vehicle. This allowed SUE Solutions to contract with UDOT and mobilize its crews within one week’s time from the initial contact made by UDOT for the SUE services. 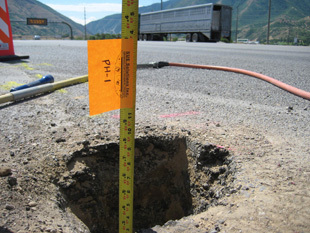 SUE Solutions scope of work included SUE Quality Level A (potholing) activities for the project’s roadway crossing safety improvements located at the intersection of US-6 and 2400 East in Spanish Fork, Utah. CRS Engineers and UDOT compiled four (4) conflict locations and supplied them to SUE Solutions where critical utility information was needed in order to successfully design the roadway safety improvements. 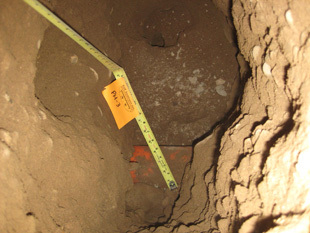 Two of the four locations involved an existing six (6) inch high pressure natural gas line, where as the remaining two locations involved potholing an existing four (4) inch intermediate high pressure natural gas line. SUE Solutions coordinated the activities with Questar Gas. At the successful completion of the Quality Level A activities, SUE Solutions provided the deliverable consisting of Quality Level A Test Hole Data Sheets and photographs, and a project narrative to UDOT and CRS Engineering.